Apperance:Standing at an above average height of six feet and seven inches (6’ 7”) with a combined weight of two hundred and twenty four pounds (224lbs) he possess quite an intimidating stature for a Dunmer. Atop that his well-kept white-silver like smooth long hair and piercing white-silvery eyes are one of the more prominent features of his being placed upon his well chiseled but slightly scarred face which contained multiple battle scars from what seemed like close quarters blade combat. His skin is that of a dark bluish tone with a slight white undertone quite clear on most places besides his hand and feet giving an indication of a heavy use whether for combat or general workmanship rather unknown. Personality: Zakndriirn Do’eth possess the personality of a centuries old hard rock that sits on the beach, clashed by the waves over and over again but never changing and never moving. But deep down hidden under those masks that he puts up constantly due to his work and his general distrust of other individual is a different type of individual, completely separate from the one that is presented to the general crowd. Practical, organized, not interested in theory or abstraction unless he sees the practical application, usually has an already made up clear visions of the way things should be, hard-working and can become very loyal. Likely to be in charge but generally refuses that type of position. Exceptionally capable in organizing and running activities but once again generally allows others to do that. In general he is a rather cold-hearted and logical individual who holds up many masks in-front of his face. Interested in security, intelligence and self-indulgence. Ambitions: The road is long and paved with bodies of countless numbers, Zakndriirn settles for little but the utmost best. Loyalty is what he gives but like a stubborn ram that will break through a wall no matter what he sets his eyes on. Beliefs: "Only sheep need a religion to follow so that they may be lead to the slaughter a wolf believes only in his own merit and own claws. Damned be fortune tellers and legend makers, I make my own future." 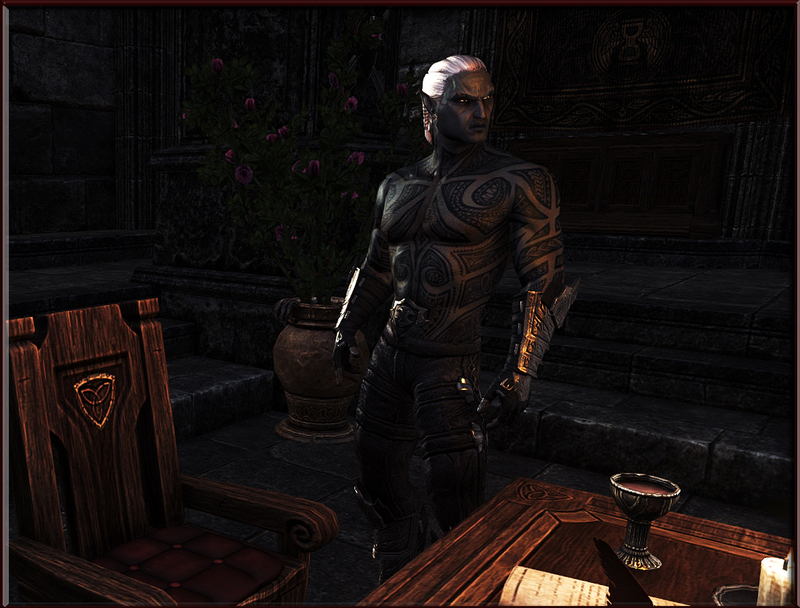 Past Experiences: Zakndriirn’s story is quite peculiar, waking up five years ago on a mysterious beach in Summerset far from civilization and any human being he would look down in the sand and find the name “Zakndriirn Do’eth” written on it whilst on his body a finely crafted assassin’s armor and equally fine daggers on his belt. He knows not who he is or what he does, memories of the skills he possessed flood his veins when he truly needs them but he has no way of knowing what might trigger them. The last five years he spent doing what felt was natural to him, bounties, assassinations, murder, thievery and contract execution whilst in the background attempting to find out who he is, where did he come from and where does he belong. Flavius Caro - Imperial? Breton? Too tiny to be a Nord. Man that ushered Zakndriirn into ISEC. Should find out more, feels like he is his superior. Keya Nightweave - Wood Elf, Bosmer, Female. Annoying, acts coy, likes pretending to be a child, most likely very intelligent yet offers childlike behavior to cover. Deviant and very open about her sexual behaviors. Raven. Ian Caldwell - Imperial? Breton? Male. Looks to be in his thirties, physically fit but unknown combat readiness or fitness. Most likely not a Raven too much brawniness for such a position. Most likely involved with Rediaana. KNOWN - NPCs, Groups, Circles with which Zakndriirn has had at least one interaction with and is on a known basis with. FRIENDLY - NPCs, Groups, Circles with which Zakndriirn has had several interactions with and is on a friendly terms with after completing multitudes of tasks, contracts etc. This is REALLY nice, Zak. Good job! New starts, old habits. New places, same old people. AUDIO PROMPT - For full enjoyment whilst reading, click here. "A home is a home as much as those who occupy it make it one. Many years had passed before me, moving from inn to inn, a job to a job before I found this hearth of mine, in certainty it will take some time to get used to a place where I can hang up my blade and my bow and know the next morning I do not need to wake so that I have to leave. I do not know why and for what reason as I mentioned that I moved from inn to inn but once again I chose the occupancy of what I call a 'home' to be within the walls of an inn, of course unlike many a time before this was... mine. These four walls which are most likely as old as I am and perhaps even older, the magnificent view I command that peers into the harbor watching as ship comes and leaves every sun up and every sun down. And it is strange to know that I never lacked for anything, I sit in the lap of luxury, I bathe in milk and honey, every night my bed is never empty but these four walls offer me comfort like no other does. Is it the need of structure that is firmly placed in my mind as that of my ancestors, to have a foundation, four walls that surround me and even though cold in the morning they offered warmth unlike any other. Last night I laid my head onto the soft mushy pillow, letting its fabric embrace my face whilst the covers of the warm furs hid away the cold of the night I stared out the window and gazed in delight as the soft night watched over me and let my slumber wash in peace a peace like I have felt like no other, not the peace of war, nor the peace of mind but absolute blissful peace. This is home."